Update: The 360 snapshot viewer was updated to version 5.1.6.515934 on June 6th. 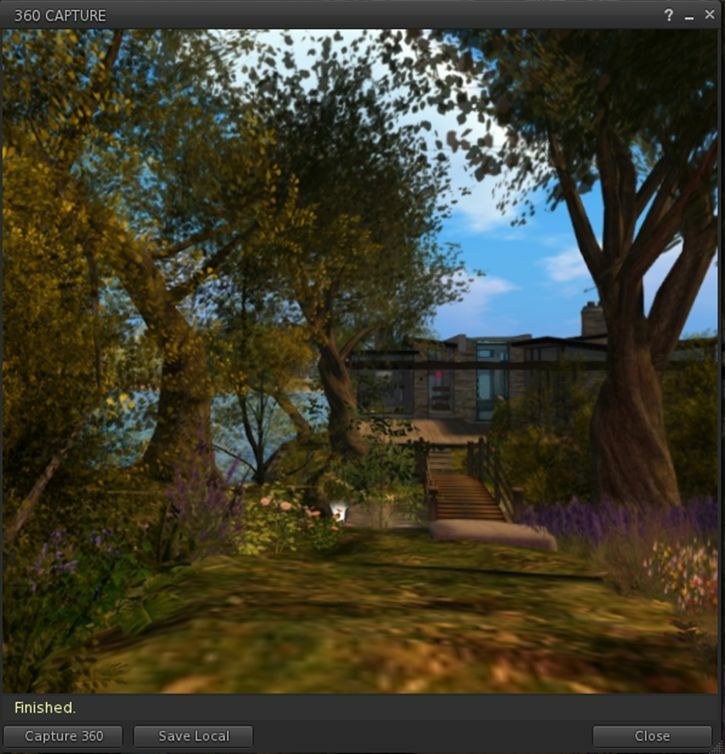 On Thursday, February 22nd, Linden Lab issued a further update to the 360-degree snapshot project viewer. While version 5.1.2.512774 brings with it some updates and changes, it still fair to say this is more an interim update than the set of improvements and capabilities some of us had been hoping for. Uses the Alex Ivy viewer code base (only the release code, this time, obviously), and so is available for Windows (32-/64-bit) and Mac OSX; there is no Linux version at present. Handles the “stitching” of a captured set of images into a single equirectangular 360-degree image ready for upload to suitable suites supporting 360-degree images. Moves the 360-degree photo option from the snapshot floater to its own floater. Sets the 360-mage resolution to 4096×2048 (no more “small”, “medium” or “large”). So, how does it stack-up? On the positive side, the new capture UI does a credible job of easing the capture process and in offering preview of the 360-degree image. Hopefully there will be some further options added to it in the future – such as image size. On the negative side the current 4096×2048 resolution could still do with improvement – Alexa Linden informed me that this work is in-hand – as it can exhibit a very definite fuzziness. Position your camera at the centre point of your 360 shot. While it is not specified, I would suggest camera in a circle to encourage the scene to load before capture. Use Menu > World > Environment Editor > Sky Presets > Edit Presets to set your desired Windlight and use the Clouds tab to freeze cloud movement. Avoid the use of Depth of Field. Press CTRL-SHIFT-C to display the 360-image capture floater. Click Capture 360 to commence the capture process. The floater will display some basic messages as the images are being captured and process, and the Lab have indicated these may be improved, depending upon feedback. Once image processing is complete, the floater will expanding to show an auto-rotating previewing of the captured image. As with any 360-degree image, you can press and hold the left mouse button while over the image and scroll around it. Note that there is currently an issue with the preview on Mac systems which can leave it black. If this happens, click Save Local and then Cancel. This should force the preview to displayed correctly. If you’re unhappy with the preview, you can re-start the process by clicking Capture 360 again, or you can save the image using the Save Local button. This will save the image in equirectangular format to a location of your choice on your computer, from where yo can upload it to photo sites supporting 360-degree equirectangular images. A welcome update to a project viewer that was a little long-in-the-tooth: obviously, as well as the 360 snapshot changes, this version also brings the viewer up to par with all of the most recent viewer releases. I was a little disappointed that there’s no support for uploads to Second Life Place Pages with this iteration of the viewer – something that had been indicated as being on the horizon in some recent user group meetings; apparently, and like the overall image resolution, it requires further work. As the 360 image captures now has its own floater, I’d also personally like to see it gain a dedicated toolbar button as well. CTRL-SHIFT-C isn’t a taxing short cut to remember, but buttons can make for convenience. That said, the thing to remember here is that this is still only a project viewer – it still has a good way to go before being ready for prime-time use, which is something the Lab fully acknowledges. So, while it is worth taking it for a drive and having a play, expect to see further improvements and added functionality appearing in – hopefully not-too-distant – future updates. I meant to note that the March 5th 2018 360 deg project viewer introduce a new bug not in the previous version whereby both 369 deg and normal 2D snaphots have some of the HUD attachments remaining in the image.. some (e.g. a weapons HUD attached to bottom left position) not all (e.g. an AO attached to bottom right position). The previous February version did not have this bug. I have not experimented further at this stage to see what types of attachment trigger this problem or if certain positions of the HUD are implicated. If its there in the next version I will try to look at it further. The current project viewer is something of a mess. Whirly Fizzle has logged an armful of JIRAs against it, unfortunately most are not open to public viewing – I believe the HUD issue is one of them. Thanks for highlighting it here. The 360 snapshot viewer, version 5.1.6.515934, June 6th 2018 appears to work very well now, with earlier test releases which incorrectiy included some HUDs in the snapshot now corrected.